and Valuable Matter which should he preserved in History. Please use the "FIND" on your browser when checking the index to biographies (we found an alpha indexing error, and have reproduced it as appeared in the original book). The biographies vary in length and cover a total of approximately 900 pages. Copies of the original can be secured from NSHS (see research instructions). Alternatives: Chappell Library which has this book on the shelves (see the Deuel County page) or Knight Museum in Alliance (Box Butte County page. Please send a generous donation & SASE. Ordering copy must be done by snail mail. Individual biographies were typed and sent by Carol Britton (Thomas Moore), Nina Clark (John L. Roseberry), Chris Geis (Alonzo McMichael), Alan Williams (James Wright) and H. Morris (Frank E. McLain). CHAPTER IV. STATE INSTITUTIONS, SOCIETIES AND ASSOCIATIONS. THE STATE BOARD OF AGRICULTURE. SCHOOL FOR THE DEAF AND DUMB. THE NEBRASKA INSTITUTION FOR THE BLIND. NEBRASKA HOSPITAL FOR THE INSANE. NEBRASKA INSTITUTION FOR FEEBLE MINDED YOUTHS. THE HOME FOR THE FRIENDLESS. SOLDIERS AND SAILORS HOME - GRAND ISLAND. SOLDIERS AND SAILORS HOME - MILFORD. STATE BOARD OF FISH COMMISSIONERS. BIOGRAPHICAL MATERIAL begins on page 123. NOTE: This reproduction started in 1998 with Chapters 4,5 and 6; plus the index to biographies. Thanks to the efforts of Bill Wever, Marilyn Estrada, Chris Geis and Brian Tingley the entire book was "finished" in 2003. Knight Museum (Alliance, NE) then loaned us a copy of the book - one that had fallen apart. Final proofing was completed Jan. 2004. Ted & Carole Miller. 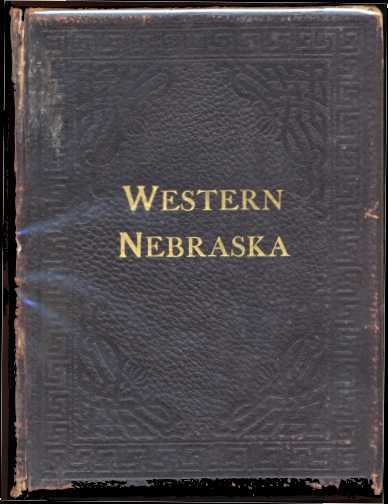 June 1998: Portions of a different book have been received, titled "Compendium of History, Reminiscence and Biography of NEBRASKA", published by this same company in 1912. Please note the word "western" is missing from that title. The entire first page of Chapter 4 in that book, matches the first page of Chapter 4 in this book (with some exceptions in capitalization). Our current suspicion is that the general history portions of the two books are the same. The biographies listed are DIFFERENT. We will concentrate on reproducing the biographical material of both books.